The Black Watch experience is a unique collection that charts the rich story of this most famous Scottish Regiment. Situated at the heart of Perth, in the historic Balhousie Castle, artefacts from nearly 300 years are displayed in an accessible, contemporary style that provides a rich and compelling backdrop. 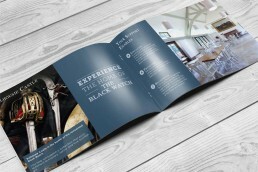 Our team has provided a range of printed promotional materials for The Black Watch including a four-page litho printed Corporate Patrons brochure.